Outlook PST Attachment Extractor software is designed in such a manner that makes easy for users to extract multiple PST files at once. Even users can add the folders containing various Outlook PST files and can extract its attachments from all the files at a time. The Outlook PST Attachments Extractor utility comes up with an option to store the data at desired location so that it makes easy for users to manage the data in an efficient manner. Even the software also allows users to make a new folder and store PST data file into it from the software panel. The software is programmed in such a way as it creates a complete extraction report of Outlook attachment in proper manner. The report contains the complete status report like file name, status, path, etc. 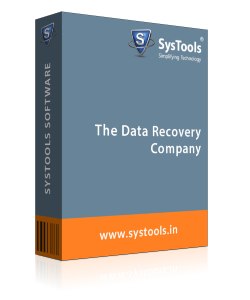 Moreover, it is saved in .csv file format in your system. Q. 1. Does the software extract attachments from multiple PST files? 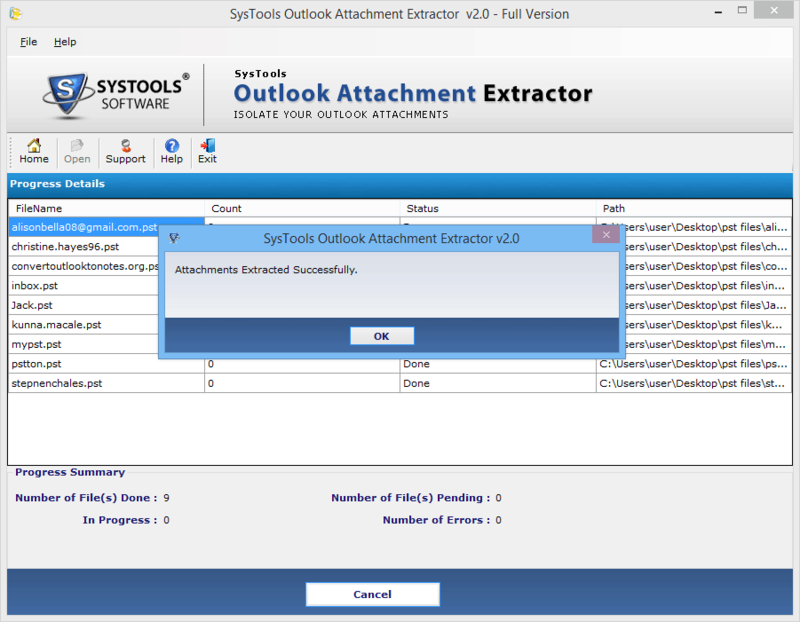 Ans: Outlook Attachment Extractor software comes up with an option to extract attachments from multiple Outlook PST data files at once. Q. 2. Does Outlook installation required to extract attachments from PST file? Ans: The software only requires Outlook its data files to perform the procedure. It does not require Outlook installation on the system to perform an action. Q. 3. Does the software supports Windows 10? 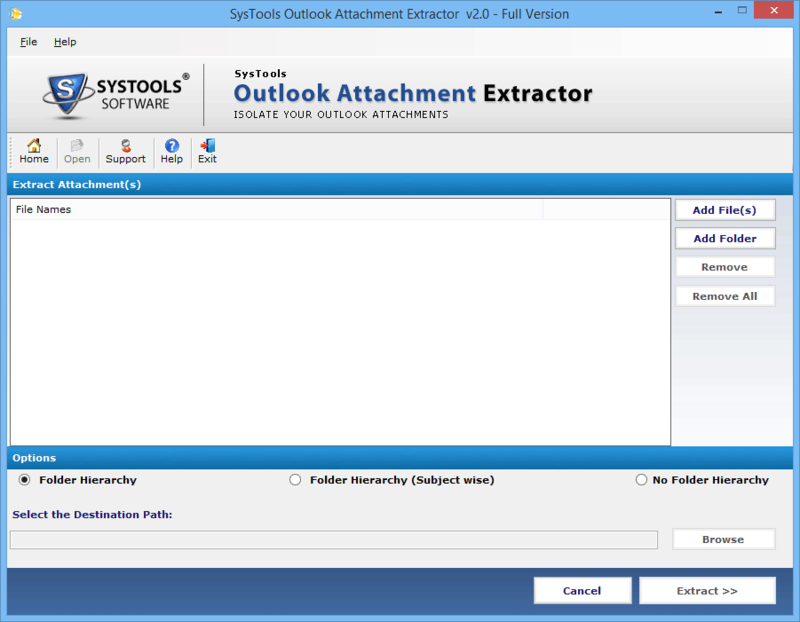 Ans: Outlook Attachment Extractor software is compatible with all the Windows OS and supports all the Windows versions, i.e. Windows 10, 8.1, 8, 7, etc. How to extract email attachment from outlook PST File? 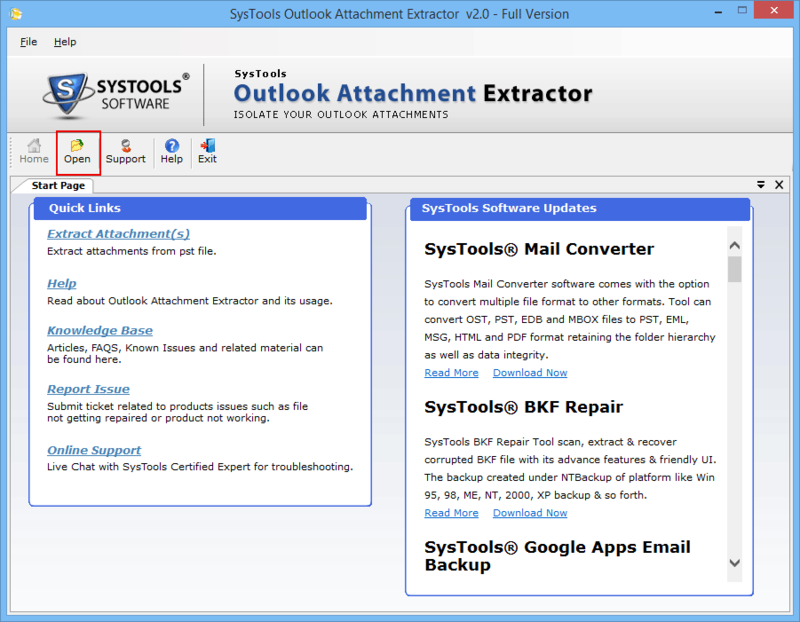 Step 1 : Download Outlook Attachment Extractor, and install it. Step 2 : Now click on Open option from menu bar. Step 3 : Go to "Add folder” option and click on it, then import all PST files on the software. 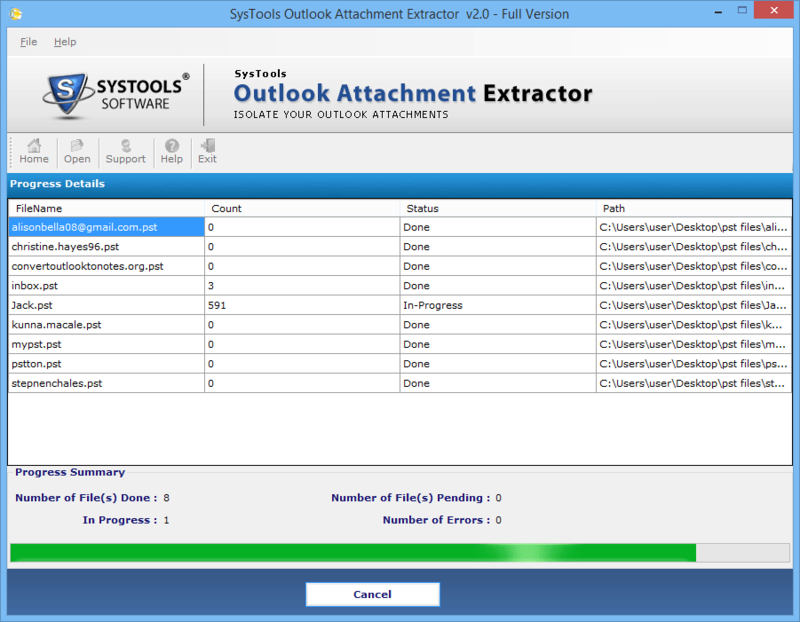 The tool extract attachment from Outlook PST files. You can also single file import with the help of “Add file” option. If you want to remove wrongly PST file so click on “Remove” or “Remove All” Option. Step 4 : The tool provide three option to maintain your files. Folder Hierarchy, Folder Hierarchy (Subject wise) and no Folder Hierarchy. Step 5 : Click on Browse option to choose the destination path to save the extracted file, then click on extraction file. Step 6 : Now tool will show the progress details. Step 7 : When progress complete, the tools gives a successfully extracted confirmation message. Step 8 : Now the tools generates a CSV report for all those attachments extracted from outlook hierarchy. I tried to launch the application on my Mac machine and when failed contacted the technical team. The technical support team helped me great deal to perform the conversion by making it clear that the software cannot be run on Mac machine but on Windows OS only. I would like to thank your organization for developing such a potent tool which performs the extraction without any fuss and in a time efficient manner. I was able to extract all the attachments from Outlook PST data files.